The number of medical marijuana purchases and the quantity of cannabis sold in Massachusetts are surging now that three dispensaries geographically dispersed across the state have opened their doors to patients, indicating a robust market for MMJ. The trends bode well for the 12 additional dispensaries that have received tentative approval from the state and hope to open soon, as well as the scores of companies that have applied for new medical cannabis business licenses. The first dispensary to launch in Massachusetts, Alternative Therapies Group, opened on June 24 and was the sole provider of medical cannabis in the state until September, when two more – In Good Health and New England Treatment Access – finally began serving patients. In September, the total amount of medical cannabis sold by all three dispensaries – one of which didn’t even open until the end of that month – was more than double the amount sold by Alternative Therapies in August, according to statistics released by the state’s Executive Office of Health and Human Services. Month-over-month increases in the number of transactions conducted have been particularly strong, jumping from about 1,100 in August to nearly 8,000 in September and then to a whopping 26,000 in October. While the number of transactions should be expected to increase as new dispensaries come online, the average number of transactions per operational dispensary has continued to grow as well, demonstrating more patients are purchasing more frequently. Alternative Therapies reported serving about about 1,500 individual patients in its first two months of sales. The dispensary sold 1,476 ounces from when it opened until the second dispensary launched on Sept. 4, according to state data. That being said, Alternative Therapies only served 14% of the roughly 11,000 registered patients in Massachusetts during that time period. 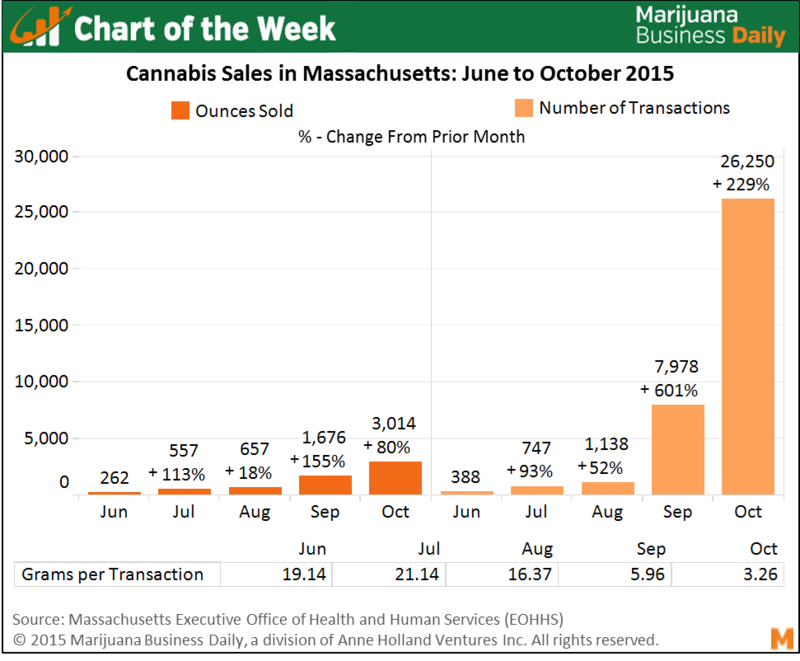 Taken together with the dispensary’s location on the far eastern side of Massachusetts, this indicates that many patients decided to wait until a storefront opened closer to them rather than make a long journey. Still, it appears some patients did indeed come from across the state to purchase – and stock up on – MMJ, as reflected in the high average purchase quantity. Many patients also likely feared inventory shortages (a common occurrence in the early months of other new markets) and therefore decided to buy in bulk. With more dispensaries opening, the inventory concern has subsided, and MMJ is easier to obtain for patients across the state. As a result, the average quantity sold per transaction has dropped from an average of 18.9 grams when just one dispensary was open to an average of 4.6 grams in September and October when three were open. In a nutshell, patients don’t have to travel as far to access medical cannabis and do not feel the pressure to stock up for weeks or months at a time in a single purchase. The surge in the number of transactions and the decrease in average quantity per transaction – coupled with overall growth in the absolute quantity sold – is indicative of a market that is really starting to gain some traction. Though businesses still face many challenges with lab testing – not to mention the 12 other dispensaries that have been granted provisional licenses but are awaiting final approval – early indicators of the viability and robustness of the state’s MMJ market are very encouraging. Do you have any data on the wholesale and retail costs associated with the products? Mike there is no wholesale market established in MA yet. An 1/8th ranges from $50 – $60. With ounces around $350 or higher.